L-R: Health Matters broadcasts live from the MAPS Museum. Paul White, R.Ph. talks with Ted Mathies, Vietnam veteran and medic, and Reed Kimball, Colonel USAR Retired and director of education for the MAPS Museum, with Brad White, R. Ph. The high school football season kicks off, and along with it comes many types of sports injuries. Especially concerning to athletes, parents and coaches are head injuries and concussions. According to the Centers for Disease Control, an estimated 300,000 head injuries occur among high school athletes each year. In this segment of Health Matters, we talk about the impact of head injuries and other traumatic sports injuries with sports medicine specialist, Dr. James Goff from Cleveland Clinic Union Hospital, who has served as team doctor for several high schools and universities. L-R: Pharmacists and hosts, Brad White and Paul White discuss concussions, head injuries and other sports-related injures with Dr. James Goff, sports medicine specialist from Cleveland Clinic Union Hospital. From routine cavities to sleep apnea and heart disease, your dentist is a key partner in overall health. As Dr. Brian Amison from Amison Dental Group explains, "The mouth is the gateway to the body." Today's program features Dr. Amison discussing the timeliness of treatment when an injury occurs, mouth guards, implants, dry mouth, the annual Dentistry from the Heart Event and more. Health Matters hosts and pharmacists, Brad White and Paul White discuss general dentistry with Dr. Brian Amison of Amison Dental Group. L-R: Pharmacists Brad White and Paul White discuss the SWAP Syringe Exchange Program and Hepatitis A with Canton City Public Health's Amanda Archer, epidemiologist and Diane Thompson, nursing director. Estate planning can sound intimidating, and many people think they don’t need to do any type of estate planning – perhaps because they have a will, or they may not be wealthy or have multiple assets. However, estate planning is for everyone. In this segment of Health Matters, we talk with Attorney Jim Contini from Krugliak, Wilkins, Griffiths & Doughterty Co., LPA about the importance of planning and hear examples that can help us. Summer is here and looking your best is usually top of mind for vacationers, sunbathers and pretty much anyone who wants to show more skin. But, as we all know, putting the pounds on is a lot easier than taking them off. In this segment, we hear about some healthy eating alternatives and get some advice on losing some of those unwanted pounds. We’ll also talk about weight management resources at Mercy Medical Center. Pharmacists and hosts Brad White and Paul White talk about healthy weight loss with Mercy's Sereen Zawahri-Krasuna. Nearly half of all adults in the U.S have high blood pressure, the most common controllable cause of stroke. This is why the American Heart Association/American Stroke Association, with the support of Massillon City Health Department, has launched Check. Change. Control., a free program to help people in our community identify, lower and maintain healthy blood pressure levels. L-R: Hosts and pharmacists Brad White and Paul White discuss the Check. Change. Control. blood pressure program with Massillon City Health Department Public Health Nurse Audrey Milburn and American Heart Association Community Health Director Tim Lewis. E-Cigs, Vapes and Juices - How Safe are They? E-cigs, vapes and juuls are hot topics. Popular among teens, you can find interesting and enticing videos on social media, but they are not necessarily popular among parents. Today we learn more about whether they are safer than cigarettes, talk about the flavored juices used in them and find out more about what the risks and consequences are from the experts at Mercy Medical Center. Mercy Medical Center respiratory therapists, Mary Duffield (left) and Dustin Shetler (right) discuss e-cigs, vaping and pulmonary effects with Medicine Center Pharmacy's Nancy Wharmby and Paul White. When it comes to medication, a lot goes on behind the scenes that impacts the final cost of medicine. Gag orders, clawbacks and PBMs, also known as pharmacy benefit managers, play a significant role in soaring medication costs. Antonio Ciaccia, director of government and public affairs for the Ohio Pharmacists Association, explains how this could be changing thanks to the efforts of a Canton politician. Americans on average do not live as long as people in other high-income countries like France, Britain and Japan. But with modern medicine and health options available in the U. S., life expectancy should be much longer. With simple lifestyle changes, we can extend our lifespan by more than a decade. In this segment of Health Matters you'll hear about practical steps you can take for healthy living and learn a few tips on how to save money at the pharmacy. Health Matters show hosts Brad and Paul White. The American Cancer Society estimates that about 20 percent of cancer cases are preventable. A key element to early detection is screenings, which can help doctors find and treat several types of cancer early before symptoms begin. Early detection is vital because when abnormal tissue or cancer is found early, it may be easier to treat as well as prevent the spread of cancer. In this segment of Health Matters, cancer nurse navigators Tara Barker, registered nurse, and Nicole Haines, registered nurse, of Mercy Medical Center talk about various cancer screenings with the experts. L-R: Brad and Paul White, hosts and pharmacists talk with nurse navigators, Tara Barker, RN, and Nicole Haines, RN, of Mercy Cancer Center. L-R: Medicine Center Pharmacy Executive VP Nancy Wharmby and Pharmacist and Host Paul White talk with Dr. Rizwan Sardar. Allergy season is here, and they can affect anyone, regardless of age, gender, race or socioeconomic status. However, allergies are more common in children and are caused when the immune system reacts to a specific allergen that has been inhaled, touched or eaten. Among the most common health problems, more than 50 million people are afflicted with asthma, seasonal hay fever or other allergy-related conditions each year. Today Dr. Heather Minto, allergist and immunologist, joins us from Akron Children's Hospital. Occupational Therapy is an important profession that helps people of all ages accomplish daily living skills through therapeutic use of everyday activities. There are often circumstances that only occupational therapy can provide support, whether it may in school and social situations, medical recovery and other specialized conditions. Today we are going to talk about the fact that April is National Occupational Therapy Month. In addition, we are going to take a few minutes to let you know about a Health Fair and Screening event taking place at Mercy Medical Center. 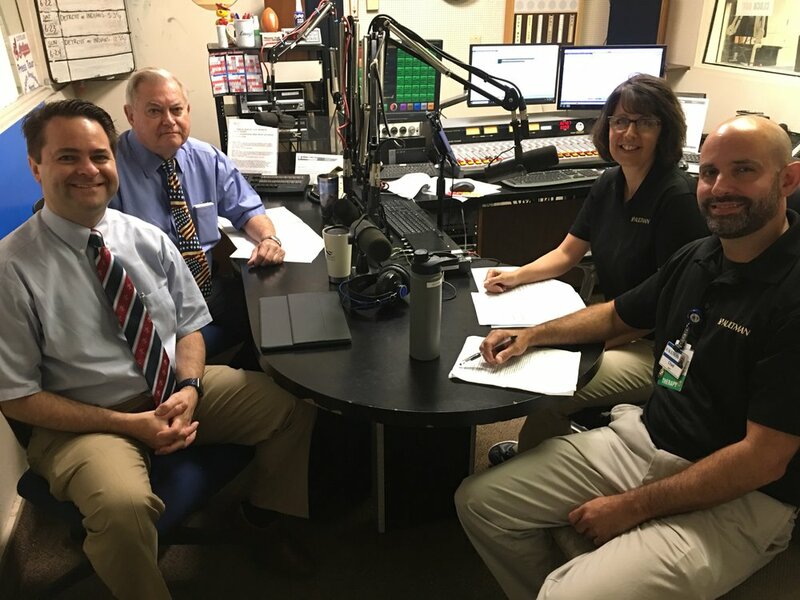 Mercy's Director of Business Development Ron Bensinger (front left) and Occupational Therapist Lindsey Kichi join hosts and pharmacists Brad and Paul White to talk about Occupational Therapy and an upcoming screening event at Mercy Medical Center. In today's podcast, we continue our conversation about pharmacy, including vaccines, supplements and our recommendations for what to keep in your medicine cabinet this spring. Brad and Paul White, registered pharmacists, discuss supplements, vaccines and share tips for what to keep in your medicine cabinet this spring. Staying active is a no-brainer when it comes to improving how you look and feel, yet fewer than one in four U.S. adults are getting the federal physical activity recommendations for aerobic and strengthening activity, according to the American Heart Association. This month, the American Heart Association is challenging everyone to get moving. 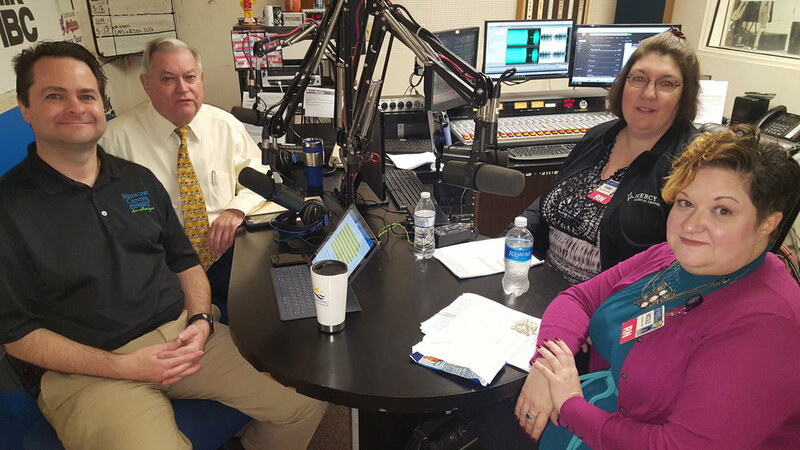 L-R: Valerie Stutler, American Heart Association social events director discusses Move More month and the 2018 Heart Ball with hosts and pharmacists, Brad White and Paul White. During today's program, hosts and pharmacists, Paul White and Brad White discuss current news and offerings in Medicine Center Pharmacies. From genetic testing and compounded prescriptions to our free kids' vitamin program and our Minerva pharmacist running in the Boston Marathon, we have a lot happening! Sexual violence affects millions of Americans – both women and men. According to RAINN, the nation’s largest anti-sexual violence organization, every 98 seconds, someone is sexually assaulted. The assault can take many different forms, but one thing remains the same: it’s NOT EVER the victim’s fault. In this podcast, we talk about treatment through Mercy's HAVEN Program and community resources available locally for victims. 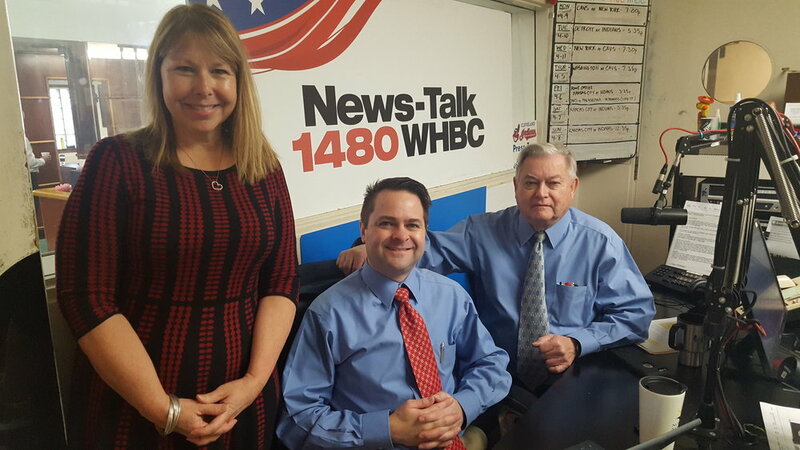 Pictured (L-R): Health Matters Hosts Brad White, R. Ph., and Paul White, R. Ph., and HAVEN Program Manager Sarah Schemmel.